This is an Agreement (“ToS,” and “Terms of Service”) between two Parties (“Us” and “Our” and “We”): zMailCloud (“ZMC”, “us”, “our” and “we”) and the customer (“Customer(s)”, “Client(s)” “you” and “your”), a business entity that orders or uses our Service. An independent technology services contractor, we are in the general business of licensing, developing, integrating, operating and marketing certain software as a service, delivered across the internet with related technical support as a packaged Service. More specifically, our Service is intended to deliver tools over the internet for collaboration, including and not limited to email, calendaring, contact, file and task sharing. You would like to use our Service and we desire to make Service available to you. By ordering or using the Service, you accept the Service in accordance with the entirety of the terms and conditions herein, effective as of your Service Commencement Date. Agreement Mechanics. Should any terms or conditions within the Introduction and Addenda potentially conflict, conflict or be inconsistent with each other, the Introduction and Addenda shall govern in the order they are presented herein, for instance, the Introduction governs over all Addenda, and Addendum 1: Definitions, governs over all other Addenda. Should any terms or conditions within this Agreement, or any Amendment, potentially conflict, conflict or be inconsistent with one another, the Amendment shall control over any language in this Agreement. If there are multiple Amendments, the Amendments shall govern in chronological order, for example, with the most recent Amendment governing over all others. You hereby acknowledge that you have reviewed the terms and conditions in this Agreement and each of the Amendments referred to herein, and We have caused Our duly authorized representatives, who are at least 18 years of age, to execute the Agreement on and as of the Service Commencement Date. This Agreement may be executed (by original signature, faxed signature, or by electronic submission by typing your typing or affirmatively marking an acceptance icon associated with a hyperlink to this Agreement) in counterparts, each of which shall be deemed an original, but all of which taken together shall constitute but one and the same instrument. 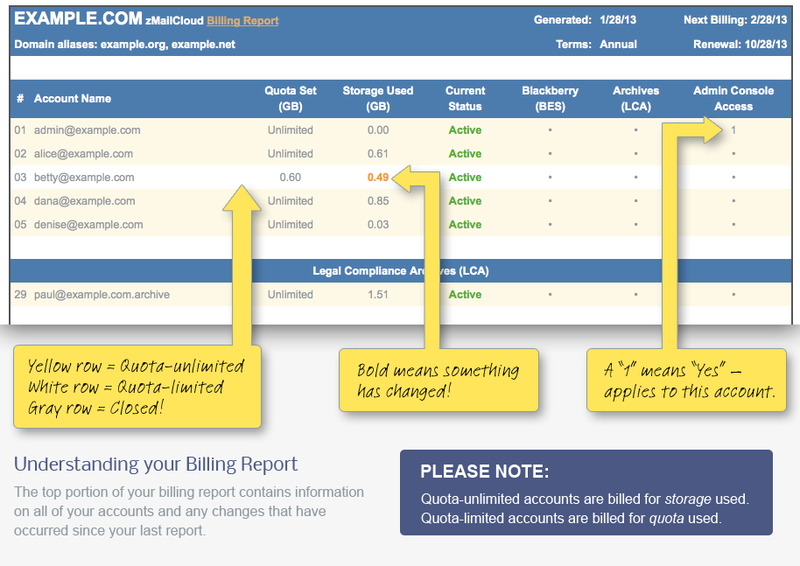 USE OF ZMAILCLOUD SERVICES CONSTITUTES ACCEPTANCE OF THESE TERMS IN THEIR ENTIRETY. 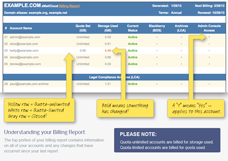 Have questions about your billing report? Click on the example below for a detailed description of terms.